The "auto-timer" feature for "Time Spent" option helps in starting a timer that automatically calculates the time spent for a ticket update. 1. To enable the "Auto-Timer" option, go to "Manage >> Categories". You will be able to enable the option while either creating a new category or while editing a category. 2. Click on "Create New Category" or the "Edit" link across an already-existing category, and traverse to the "Ticket Update Options" section. 3. Under the "Enable autofill time spent?" option, choose "Yes". 4. 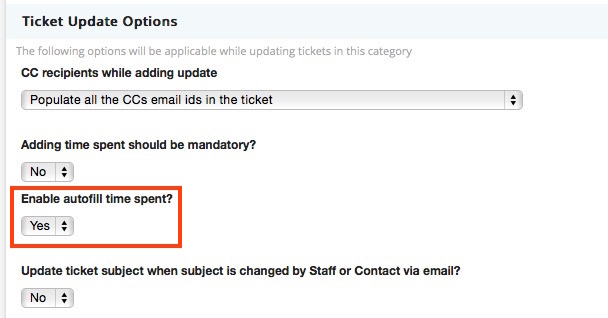 Once the option is enabled, you can begin using the auto-fill feature for updating a ticket while either adding a "new update", or a "new private note". You can also pause the timer if needed.